The Annex East pop-up has been open in Stratford since the 21st of July and will be there for the duration of the Olympic games. Situated at the end of Carpenters Road, near the Aquatics Centre, it’s closer than a stone’s throw from the gates but inside is another world. 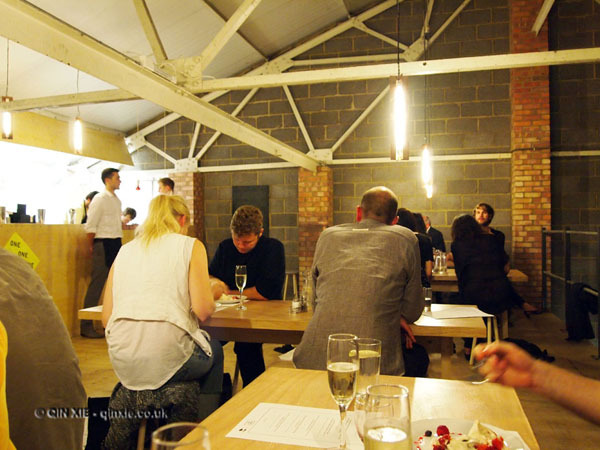 The 1800 square-foot warehouse space combines a pop-up restaurant, fully licensed bar, entertainment space and gallery. Split into two levels, the ground floor is an exhibition space showcasing artwork from independent galleries in London including Limoncello Gallery and Hannah Barry Gallery. The mezzanine level, on the other hand, hosts live music, a custom designed bar and Jimmy’s Supper Club run by Jimmy Garcia of Southwest Supper Club. During the day, themed meals, based on the last five Olympic hosts (Beijing 2008, Athens 2004, Sydney 2000, Atlanta 1996 and Barcelona 1992), are offered alongside gourmet sandwiches and snacks. The Beijing 2008, for example, is a duck and red pepper noodle salad with chilli, lime and coriander dressing. Don’t worry about missing the games either. A large flat screen will be available to view the games whether you’re having a spot of lunch or simply enjoying a much needed drink. In the evening, the vibe completely changes. Still casual, dinner is a sit down affair with different events running each night. With wine matching, film and quiz nights running, there’s always something other than the food to keep you occupied. Plus, the bar is licensed until 2am. But if food is the main reason you’re heading to Annex East, then you certainly won’t be disappointed. It’s not quite Michelin quality but it’s impressively prepared, especially when you realise how small the kitchen actually is. You get a choice of starters, mains and desserts alongside a set trio of canapés and petit fours. For starters, the smoked British duck breast is particularly good. Delicately smoky and thinly sliced, the meat is tender and well balanced in flavour. Served with cherry compote, cherry coke reduction and savoury cherry muffin, it’s really classic combinations reinterpreted. The trio of pork makes a good solid main if you’re hungry. Crisp pork belly, confit cheek and pancetta crisp offers contrasting textures while the spiced apple purée and Calvados jus whets the palate with fruity acidity. 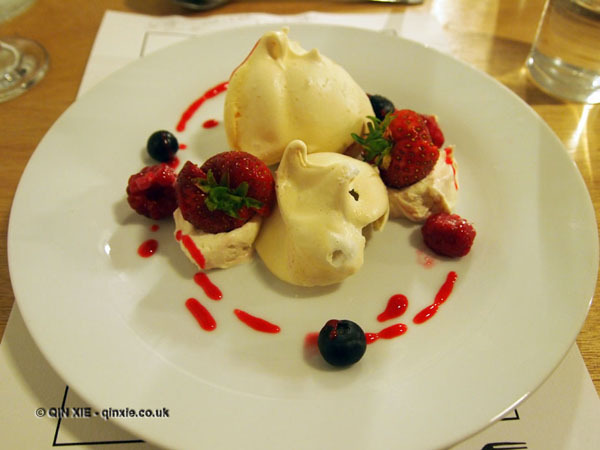 The Eton Mess has to be the tidiest sweet around – raspberry coulis neatly drizzled over berry ripple meringues, strawberry cream and fresh berries. It’s quintessentially English and truly delightful. The service will be touchingly personal because, though it’s not inside someone’s home, it is a Supper Club and not a restaurant. But please do leave a tip – it’s easy to see these guys work incredibly hard to create what promises to be a wonderful evening.